If you work in the datacomm installation business, then you know Paladin. Sean, for example, is very proud of the set of Paladin CAT5 crimpers he owns. After going through a couple of sets, he finally bought a “good” set — by Paladin. But did you know Paladin makes multitools, too? They do, and they call them PowerPlay. Specifically, they make three models, one designed for datacomm specialists, one for telcomm people, and one for electrical work. The other models trade out various tools for specific tasks. For example, the PT-540 adds a nut driver (electrical) and the PT-525 gives you two punchdown tools instead of one (telcomm). 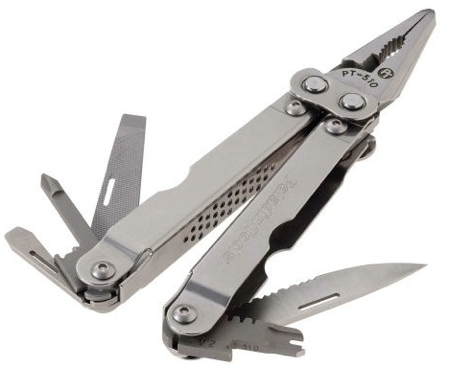 Street pricing runs around $45 for all three, which doesn’t seem too far out compared to what you’d pay for a Leatherman or other brand-name tool. Anyone else as old as me? For the data work I do, I use the cut/no-cut 110 & 66 blades. This is another example of having the right tool for the job making all the difference. What street pricing were you referring to? I don’t see anything under ~$80. I like the Harris tool too. It has a strong spring and you can get a double sided hole starter bit (metal+ wood) for it which is a lot stronger than most automatic center punches. I like finding things left behind by previous craftsmen. It’s like a time capsule. While remodeling my bathroom, I removed a medicine cabinet and found some graffitti which mocking the writer’s co-worker. it gave me a chuckle. I own the 525, it travels everywhere on my belt. 1. The monster gripping power. That SOG multiplier linkage means that if you can grip it, it’s not going anywhere. 2. Blade is pretty good and stays sharp. 3. File is a life saver, use it all the time. 1. That monster grip comes at a price of small jaw opening. Lots of times the nut is just to large to get a good grip on it and still put good leverage on the handle. 3. I discovered that I rarely use the punch down tools. I would have been better off getting the standard SOG pliers. — ” a knight without armor in a savage land”? One of the issues I have had with the screwdriver-type functions is that when you are applying an above-average amount of force, the blade/tool guards sometimes snap from place (along with the flexing at the plier joint, which plagues MANY multi-tools). But the -525 also comes with a hex drive quickchange for the 1/4″ socket adapter.. WIth this you can lock it at 90deg, and use a standard Q/C screwdriver bit with very solid leverage.